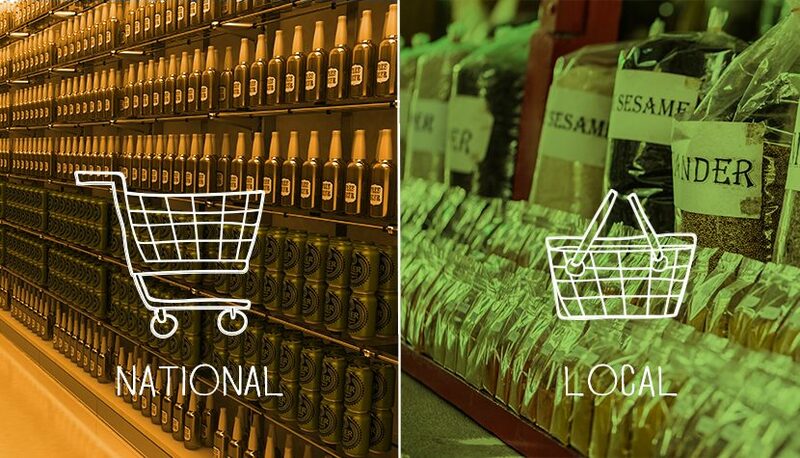 National vs. Local Food Brands: We ask Retail Food Buyer questions so you don’t have to. This series has one goal: help your food brand get on – and stay on – the shelf. We asked these questions in interviews and surveys for my book or they were submitted by food companies that attended our Emerging Food Brands Forum. Local vs. National Food Brands is more than the old David vs Goliath story. Trends show national brands are hurting with consumer confidence in “Big Food” at a low point after 25 straight years of growth. Here, we are sharing an excerpt from my book, Moving Your Brand Up the Food Chain. In Chapter 3, The Buyer’s Perspective, we surveyed 1,500 retail food buyers and conducted in-depth interviews with a dozen more. Then I summarized the answers with some interpretation and analysis of their answers geared toward benefiting local, smaller or regional food brands. 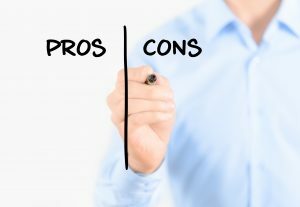 For these particular questions, we asked both ways to get the full perspective: What are the pros and cons to being a national food brand supplier? and What are the pros and cons to being a local or regional food brand supplier? Your buyers and retailers are arguably the most important people you will deal with as you make your move up the food chain. They are the gatekeepers that stand between your products and the end-line consumer, and the growth of your company and its branded products depends on the success you have working with them. Before you can sell to your consumers, you must first sell to them. There is good news and bad news when it comes to selling to your buyers/retailers. The good news is that your buyers and retailers are just as interested as you are in taking advantage of the rising influence of local, smaller, and regional companies. The bad news is that they must be convinced that your products are more promising than those offered by your many competitors. In my experience, the best way to sell to buyers and retailers is to understand the needs and desires motivating them. To that end, I asked numerous buyers and retailers, as well as some brokers and distributors, a battery of questions designed to reveal the driving factors when they are deciding which companies to partner with. Question 11: What are the pros and cons to being a national food brand supplier? In many ways, the buyers and retailers I interviewed spoke from both sides of their mouths when it came to the attributes of national suppliers. They generally liked the fact that national suppliers had bigger budgets, could produce a variety of related products in bulk, and came with built-in brand recognition. However, many buyers and retailers also said that the drawbacks, which came with national suppliers, included inefficient spending, demand-side product shortages, a potential lack of product freshness, and the fact that their products are available everywhere. Our advice to local or regional manufacturers would be to leverage the cons of national suppliers and counter the pros by presenting a comprehensive plan for increasing your brand’s recognition and voicing your willingness to broaden your product line (if possible). Question 12: What are the pros and cons to being a local or regional food brand supplier? This question ties directly to Question 11. The most obvious factor here, according to our buyers and retailers, came down to brand recognition. Most them believed that strong local and regional brand recognition was a major asset for smaller manufacturers, while also claiming that weak national brand recognition was a major drawback. Many liked the fact that smaller manufacturers could offer unique and often fresher products, while also showing a greater willingness to innovate and align with industry trends. Many also worried about the limited operations capacity and ability to grow that they believe comes with smaller companies. My advice here is much like my advice for Question 11: expose the cons of the national suppliers and leverage the pros of smaller companies like yours. Counter buyer and retailer doubts about brand recognition and operations capacity by showing them plans for growth. Both questions about buyer/retailer perceptions of national versus regional food brand suppliers should be part of the communication you have with them. Such communication is the foundation of strong manufacturer and gatekeeper partnerships. There is no silver bullet when it comes to Local vs. National Food Brands. National may beat you on price because of gargantuan run sizes, shelf life because of mountains of preservatives, and brand awareness. Local should counter with small-batch positioning, transparency on product ingredients and a community building from their regional power base. In short, in the war over Local vs. National Food Brands, leverage your size, community and localness! Discover more retail buyer insights in my book, Moving Your Brand Up The Food Chain™ to see how you can get your brand on the shelf and stay on the shelf. Local Food Brands Capitalize on Grocery Shopping Male Market Trend: Why Is Trust Diminishing with Big Food?